Former First Lady Michelle Obama gives a once-in-a-lifetime opportunity to hear her speak in person as she presents her brand new book 'Becoming'. One of the most inspiring figures of our times, Michelle Obama rose to world prominence as the wife of first African American President of the United States, serving as the first lady from 2009 to 2017. Although the worldwide icon is playing to some rather large arenas Michelle Obama promises intimate and personal conversation as she speaks about her life in and out of the White House. 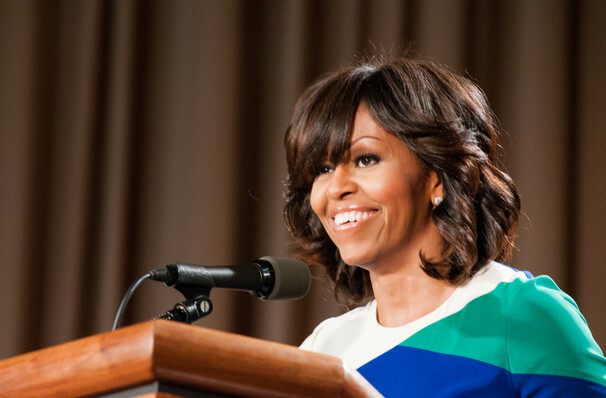 In this funny, and insightful evening learn all about how Michelle Obama became one of the most influential women in the world. Using her powerful platform for the greater good, she set up and led four enriching initiatives - Let's Move, a charity dedicated to fighting childhood obesity, Joining Forces, a charity offering veteran support, Reach Higher, an organization that encourages higher education and Let Girls Learn, an initiative that promotes and fosters girls' education throughout the world. Sound good to you? Share this page on social media and let your friends know about Michelle Obama at State Farm Arena. Please note: The term State Farm Arena and/or Michelle Obama as well as all associated graphics, logos, and/or other trademarks, tradenames or copyrights are the property of the State Farm Arena and/or Michelle Obama and are used herein for factual descriptive purposes only. We are in no way associated with or authorized by the State Farm Arena and/or Michelle Obama and neither that entity nor any of its affiliates have licensed or endorsed us to sell tickets, goods and or services in conjunction with their events.